Austin Seferian-Jenkins (ASJ) has a new home. The talented, but troubled TE has signed a two-year deal with the Jacksonville Jaguars worth $10 million. ASJ has a well-documented past with substance abuse and off the field concerns. I am confident the former 2nd round draft pick has turned a corner both in his personal life and his football career. Opening the 2017 season serving a two-game suspension for violating the NFL’s substance abuse policy, ASJ went on to have his most productive season as a pro to date and played his highest number of games in a season (13). Despite this being his 4th year in the league, ASJ is still only 25 years old. For comparison, rookie TE prospect Hayden Hurst will turn 25 during his rookie season. Whilst ASJ’s 2017 production wasn’t overly impressive (finishing as the TE20 with 357 yards and 3 touchdowns per Fantasy Pros), it was enough to remind us of the talent that he possesses. ASJ was also on the receiving end of two questionable no-touchdown rulings. The first being a very publicized decision against the Patriots, and a second against the Panthers. Had these calls gone his way, his final season stat line would have looked slightly better. (A timely reminder from @MatthewBerryTMR as I write this article). Ultimately, ASJ wasn’t in a prolific offense. The Jets, led by journeyman Josh McCown, finished as the 24th ranked offensive unit on the season. 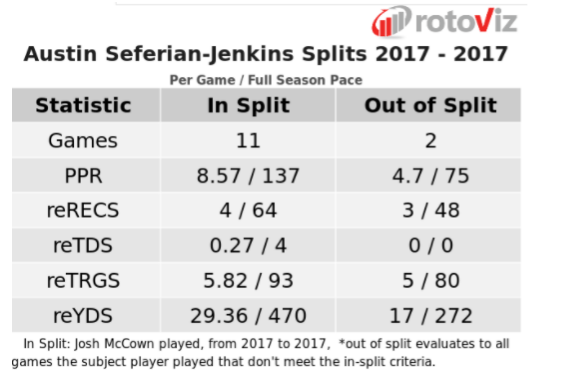 Once McCown’s season ended with an injury, things got even worse for ASJ (per Rotoviz Game Splits app) as he tried to catch passes from Bryce Petty. Based off ASJ’s overall lack of production to date, it’s quite clear that Jacksonville hasn’t signed him for what he has done so far in his career, but rather what he has the potential to do. ASJ will join a pass-catching group featuring wide receivers Marqise Lee, Dede Westbrook, Keelan Cole, and new addition Donte Moncrief. Jacksonville also signed TE Niles Paul to a 2-year deal. Given that he only has 68 career receptions for 856 yards over 6 seasons, I’m not worried about competition for targets from Paul. Long-term Jaguar Marcedes Lewis was cut, at the cost of only $250k in dead cap space, freeing up $3.75 million per Spotrac. This means that ASJ will have no competition at the TE position for targets. The question that will determine ASJ’s long-term dynasty value is whether he will see enough volume to push for TE1 numbers? Jacksonville has committed to Bortles for at least the 2018 season, so let’s dig into the man who will be throwing ASJ the ball this year. According to Josh Hermsmeyer’s airyards.com Bortles only attempted 512 passes last year, over 100 attempts less than 2016, as the Jaguars leaned on rookie RB Leonard Fournette. Only 79 of those passes went to the TE position (per ESPN). Signing All-pro lineman Andrew Norwell, and making him the NFL’s highest-paid guard, signals Jacksonville’s intention to follow the run-first approach that led them to the AFC Championship game. Bortles is around league average for completion percentage for targets that travel 20 yards or less downfield. We then see a significant dip in targets between 30 and 40 yards before his completion percentage spikes back up after 40 yards. Given the speedy WR’s Bortles will have at his disposal, I do not envision ASJ running deep routes. Given Jacksonville’s inclination to run the football, combined with Bortles below average completion percentages and lack of volume to the TE position, ASJ (like most TE’s outside of the elite tier) will have to depend on touchdowns for his fantasy football upside. According to Sharp Football Stats Bortles targeted Marcedes Lewis more than any other player in the red zone last season. At 6’6″, ASJ will present Bortles a big bodied red zone threat that is lacking in his other receiving options, now that Lewis is out of the picture. None of his aforementioned WRs measure over 6’2″. If Bortles continues to look the way of his TE in the red zone, ASJ will have week to week touchdown upside. There is the potential for Bortles to throw more targets to the TE position, especially with an improved receiving option in place, but this needs to happen on the field before we can have confidence in predicting it. If ASJ does see targets all over the field, he has the physical skill set to take advantage ( tested with a 77th percentile SPARQ score). ASJ moving to Jacksonville presents dynasty players with a buy-low opportunity. Had ASJ signed with a more explosive offense like Seattle, or New Orleans, he probably would have been much more difficult to acquire. He has the potential to finish as a top 12 TE on any given week based on his touchdown upside and the volatility of the position overall. Right now, he is the TE22 with an overall ADP of 156. If you are a player who likes stream or platoon the position, ASJ should be a cheap acquisition to add to your TE group. He might even be sat on your waiver wire in shallower leagues (60% ownership on FleaFlicker). For leagues that require you to start two TE’s, ASJ is a serviceable TE2 option with TD upside that can win your weekly matchup. You can let me know what you think about ASJ on Twitter at @FF_DownUnder.